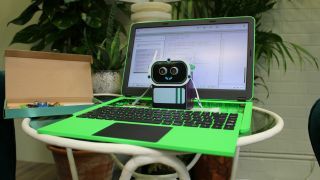 The new, updated Pi-top is hoping to inspire students to get into computing by taking a ‘learning by doing’ approach. There’s little doubt that we’re heading towards a fourth industrial revolution with the spread of artificial intelligence into more and more of our products, from smart speakers in our living rooms to self-driving cars on our roads, and even in our workplaces. There is an obvious fear that when machines can do our jobs better than us that we’ll be replaced. The only hope for us to retain our jobs (or at least continue to be in employment) is to gain skills that make us useful once our current jobs get taken over. “When you go into an English literature class they give you Shakespeare. When you go into a history class, you get the top-40 hits of everything that’s happened over the last thousand years, it’s incredibly interesting. The purpose of the Pi-top is to inspire students; not just to show them technological skills, but why they might want the technological skills. The Pi-top is essentially a laptop that is powered by the remarkable Raspberry Pi. Unlike other laptops, the Pi-top allows you to access the internals and play with them. This is managed by having a keyboard panel that slides down, exposing the Raspberry Pi, the Cooling Bridge and the modular track that other elements can be plugged into. These elements include a unit called Pulse which has a speaker, a microphone and an LED pad, allowing you to turn your Pi-top into an Alexa-compatible device. Included with the Pi-top is an Inventor's Kit that includes LEDs, motion sensors, buttons, and an instruction kit for creating robots, synthesizers and lighting arrays. Everything you need to get a hands-on experience with computer science. And that’s the whole crux of Pi-top’s approach to learning. “You can watch someone swimming on YouTube all you want, if you jump into a lake, you won’t know how to swim.” Lozano said. The Pi-top is available now in the bright green you see above, and is $319 (about £240, AU$410) with the Pi included, or $284.99 (about £216, AU$370) without. And because it’s modular, you can replace the Raspberry Pi every time a new one comes out. Black Friday is just around the corner. Make sure you get the best deals with our Black Friday deals. If you need a new laptop now, take a look at our laptop deals page.